If you want to race, you have to register. To register online click here or mail in a copy of our printable registration form. Registration fee is $75 until 1/14/14, $80 from 1/15/14 – 3/6/14 and $85 from 3/7/14 – 4/10/14. Registration will be available at the Expo on 4/11 and 4/12. 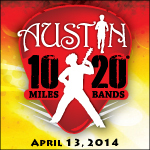 You will receive a registration confirmation email upon receipt and updates as race day nears. Periodic newsletters will be posted on this website and final information emails will be sent out approximately three weeks before the event. Race packets with your bib number, corral assignment, race technical t-shirt and final instructions are required to be picked up prior to the race. To verify registration click here.